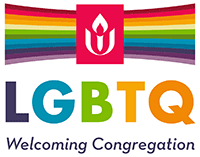 Unitarian Universalists draw on many faith traditions, social themes or human interests in our worship. Any given Sunday service, may be based on ideas originating in Judaism, Christianity, Islam, Earth-centered religions, science, social justice or any number of other subjects. Through all this variety, it is entirely possible to find yourself in a worship service that does not appeal to you at all. Should this be the case, please consider this service to be for your neighbor, and maybe the next one will be for you. You can usually find a brief description of the worship topic in the worship calendar so you will know what to expect. Most Sundays, a greeter will greet you when you enter the church and give you a program so that you can follow along with the service as it happens. Many times the rituals will be explained as they are performed. You will not be asked to agree to any religious creed or statement of belief. Unitarian Universalists believe that beliefs are very personal and that it is the responsibility of each person to discern their own individual beliefs. You may be asked to agree with some basic principles to guide human interaction like compassion and loving kindness. If you have ideas to improve worship, musical talents to offer, or a worship theme you would like to champion, we heartily welcome your input. Please contact the minister by email, or the worship committee by email.